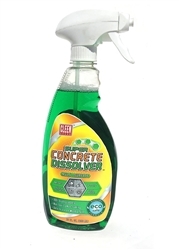 Super Concrete Dissolver is a 100% biodegradable concrete dissolver designed to quickly and easily remove concrete and Portland cement-based material from all surface types. Its Eco-Safe formula means Super Concrete Dissolver is FREE from harsh acids and is completely non-hazardous to equipment while remaining fast acting. It’s even safe to use Super Concrete Dissolver on wood and paint! Remove concrete and Portland cement from all surfaces Super Fast with Super Concrete Dissolver! Concrete Mixers * Tools * Stone Surfaces * Glass * Wooden Decks * Mixer * Trucks * Ceramic Pavers * Paint * Concrete Molds * Work Boots * Tiles * Siding * Car and Truck Tires * Clothing and Much More!